few years ago I was in New York City and saw women everywhere with them on. I’d never really seen them worn fashionably before, and it caught me off guard how many passersby I saw rocking the rain boot or “wellies”. 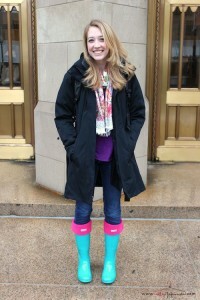 (Or galoshes, for those a tad more old school.) 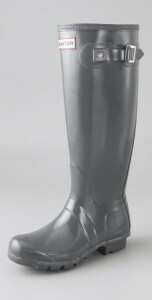 Most rainboot brands and styles now come in a traditional version or a glossy version, which made them more appealing. How exactly do you wear these practical shoe staples and still look cute? I have a few simple suggestions. 1. Show off your legs. 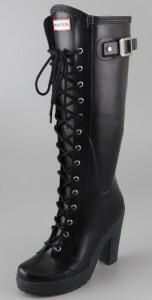 These boots are meant to be fun, bold, and not taken too seriously. They look mad cute with shorts, especially the denim cut-off kind or more casual preppy pair. Avoid large/baggy shorts or skirts that come too close to over the knee. Remember how all the celebs starting wearing their UGG boots with flirty skirts and shorts a few years ago? Same concept here, but you can get these as soaking wet as you want. 2. Leggings (or “jeggings“) are your friend. It’s a no-brainer to wear these functional boots with functional leggings. It’s comfy, it’s warm, and it’s easy to dress up or down. If your rain boots are solid-colored, you can go nuts with the different kinds of leggings you pair with them…patterned, lace, striped, ribbed. 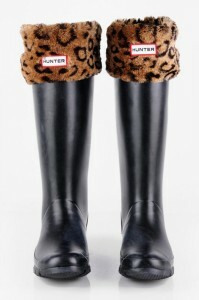 If your wellies are patterned (like this hot Gucci pair,), stick to denim jeggings or solid leggings so you aren’t hurting the eyes of everyone around you. Celebs love their rain boots, and their savvy stylists teach them how to layer their look for simple chic, even when the weather is less than sunny. Add detail to otherwise blah rain boots with piling on a scarf, a cool trench, sunglasses, carrying a substantial bag, or even a sophisticated hat. What’s trendy with rain boots is definitely tall socks meant to fold over the top of the rainboot, preferably in a contrasting color so they have an entirely new look. 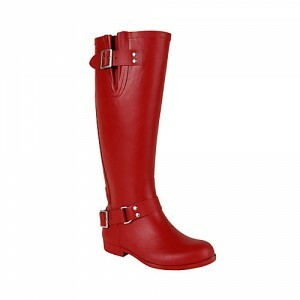 This is especially nice if you have only one pair of boots. Just buy several colors of socks (around $30 each,) and you suddenly have “new” pairs of boots!